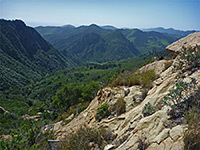 Although the summit lies in the adjoining Los Padres National Forest, 2,458 foot Gaviota Peak is the main hiking destination in Gaviota State Park, reached by a pair of paths starting from a trailhead just off US 101, together forming a loop of 6.5 miles. 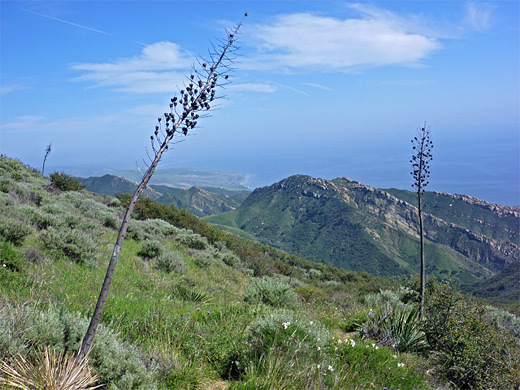 The peak is part of the Santa Ynez Mountains, which extend 70 miles along the coast and reach a highpoint at 4,707 foot Divide Peak, but Gaviota is more than tall enough to give fantastic views of the Pacific, south to the Channel islands and east towards Los Angeles. One much closer destination (half a mile) is Las Cruces Hot Spring, a small, 100 Fahrenheit pool of rather cloudy, sulfur-smelling water, surrounded by vegetation; nice to soak in but not much to look at. The elevation gain to the peak is 1,950 feet, mostly over exposed, treeless slopes (especially on the southernmost of the two paths, the Trespass Trail), so the trip can be quite strenuous, especially on a sunny summer's afternoon. Rattlesnakes are quite common, and signs also warn of the dangers posed by mountain lions. 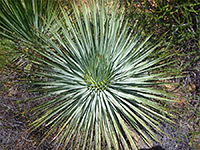 Plants include one species of yucca (hesperoyucca whipplei), common towards the upper reaches of the mountains. The views from the summit are apt to be rather hazy, but in spring at least the hike is very good, partly due to the abundant flowers and the crisp, green scenery. The surroundings are somewhat less scenic in summer when the grass and bushes become withered. 22 views of the trail, and the state park. The Gaviota Peak trailhead lies at the south end of a very short spur road on the east side of US 101 at the Hwy 1 intersection. A parking fee of $2 is charged, though a few free places are available a little way back, on verges. The valley at this point is shady and wooded, a mix of oak and bushes, with flowers growing in sunny clearings. 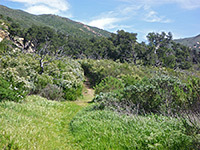 The path is along an old forest track - now the Gaviota Peak Trail, which climbs to within 220 feet of the summit, and continues eastwards along a ridge in the national forest, and this provides the shorter route to the peak. However a more scenic alternative is via the Trespass Trail, which forks right shortly after the start. If making a loop, this is the best option to begin, as the elevation gain is more gradual, and the views because steadily better; the other path is steeper and has limited views until just before the end. 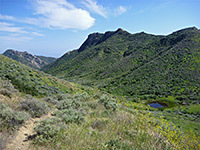 The Trespass Trail soon leaves the woods and crosses a grassy hillside, giving the first views of US 101 and Gaviota Canyon. The route curves in and out of a drainage then ascends more steeply, through light woodland, round a corner and up to a gate in a fence delineating the boundary between the state park and the national forest. Beyond, the land drops down slightly to a flattish bowl, quite overgrown on account of dense clumps of short, stout bushes and a few taller trees, still with many wildflowers. The trail enters a ravine, bordered by a rocky ridge to the left and gentler slopes to the right, sprinkled with exposed boulders. There is no sign of the summit yet. The land rises to a saddle, marked by a small pond, where two lesser-used trails continue east but the main route turns north and, after a brief descent, starts the steepest section of the journey, up another 1,000 feet, into a little ravine for while and then mostly up a broad hillside, eventually reaching a flat area that gives the best views, since the summit just beyond is somewhat overgrown. The panorama over the last half mile or so is unobstructed, encompassing a hundred miles of the coast and south across several oil rigs to the hazy outline of the Channel Islands. The path continues down the far side of the summit to a ridge, where it meets the old vehicle track once more. Turning left, the Gaviota Peak Trail descends steeply, winding into a wooded valley that soon hides the coast, instead giving fleeting views only of Highway 101 and the upper end of Gaviota Canyon. A temporarily more level section is marked by another national forest sign, after which the terrain is steep again, dropping down to a grassy area beside the creek, where a short, unmarked spur path leads to the hot springs. The last section is alongside the stream, through wooded surroundings, frequented by tree lizards.